Trundling along the dirt roads of the Amazon, the giant logging lorry dwarfed the vehicle of the investigators following it. The trunks of nine huge trees were piled high on the back – incontrovertible proof of the continuing destruction of the world’s greatest rainforest and its most endangered tribe, the Awá. Yet as they travelled through the jungle early this year, the small team from Funai – Brazil’s National Indian Foundation – did not dare try to stop the loggers; the vehicle was too large and the loggers were almost certainly armed. All they could do was video the lorry and add the film to the growing mountain of evidence showing how the Awá – with only 355 surviving members, more than 100 of whom have had no contact with the outside world – are teetering on the edge of extinction. It is a scene played out throughout the Amazon as the authorities struggle to tackle the powerful illegal logging industry. But it is not just the loss of the trees that has created a situation so serious that it led a Brazilian judge, José Carlos do Vale Madeira, to describe it as “a real genocide”. 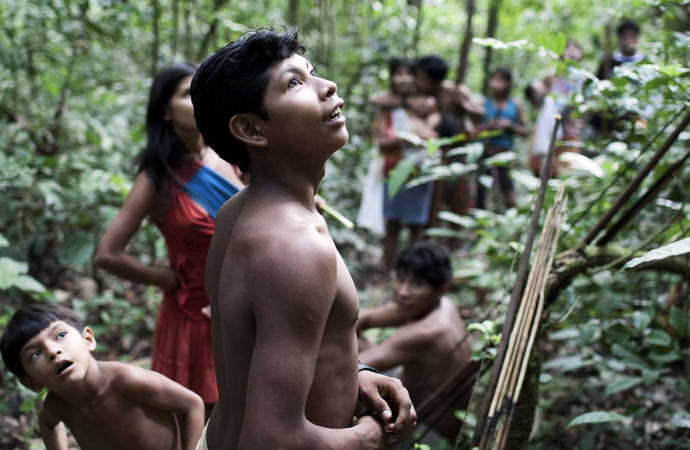 People are pouring on to the Awá’s land, building illegal settlements, running cattle ranches. Hired gunmen – known as pistoleros – are reported to be hunting Awá who have stood in the way of land-grabbers. Members of the tribe describe seeing their families wiped out. Human rights campaigners say the tribe has reached a tipping point and only immediate action by the Brazilian government to prevent logging can save the tribe. This week Survival International will launch a new campaign to highlight the plight of the Awá, backed by Oscar-winning actor Colin Firth. In a video to be launched on Wednesday, Firth will ask the Brazilian government to take urgent action to protect the tribe. The 51-year-old, who starred in last year’s hit movie The King’s Speech, and came to prominence playing Mr Darcy in the 1995 BBC adaptation of Pride and Prejudice, delivers an appeal to camera calling on Brazil’s minister of justice to send in police to drive out the loggers. The Awá are one of only two nomadic hunter-gathering tribes left in the Amazon. According to Survival, they are now the world’s most threatened tribe, assailed by gunmen, loggers and hostile settler farmers. Their troubles began in earnest in 1982 with the inauguration of a European Economic Community (EEC) and World Bank-funded programme to extract massive iron ore deposits found in the Carajás mountains. The EEC gave Brazil $600m to build a railway from the mines to the coast, on condition that Europe received a third of the output, a minimum of 13.6m tons a year for 15 years. The railway cut directly through the Awá’s land and with the railway came settlers. A road-building programme quickly followed, opening up the Awá’s jungle home to loggers, who moved in from the east. It was, according to Survival’s research director, Fiona Watson, a recipe for disaster. A third of the rainforest in the Awá territory in Maranhão state in north-east Brazil has since been destroyed and outsiders have exposed the Awá to diseases against which they have no natural immunity. Such is the Awá’s affinity with the jungle and its inhabitants that if they find a baby animal during their hunts they take it back and raise it almost like a child, to the extent that the women will sometimes breastfeed the creature. The loss of their jungle has left them in a state of despair. “They are chopping down wood and they are going to destroy everything,” said Pire’i Ma’a, a member of the tribe. “Monkeys, peccaries, tapir, they are all running away. I don’t know how we are going to eat – everything is being destroyed, the whole area. In an earlier interview with Survival, another member of the tribe, Karapiru, described how most of his family were killed by ranchers. “I hid in the forest and escaped from the white people. They killed my mother, my brothers and sisters and my wife,” he said. “When I was shot during the massacre, I suffered a great deal because I couldn’t put any medicine on my back. I couldn’t see the wound: it was amazing that I escaped – it was through the Tupã [spirit]. I spent a long time in the forest, hungry and being chased by ranchers. I was always running away, on my own. I had no family to help me, to talk to. So I went deeper and deeper into the forest. The Survival campaign reflects growing international concern over the plight of the world’s remaining indigenous tribes. Earlier this year the Observer revealed how police were colluding with tour operators in India’s Andaman Islands to run human safaris into the jungle heartland of the protected Jarawa tribe. A video showing half-naked Jarawa women and girls dancing in return for food caused outrage in India and around the world. Further revelations followed, exposing human safaris in Orissa, in India, and in Peru, where tour operators are profiting from the exploitation of Amazon jungle tribes. The Brazilian embassy in London referred requests for a response to the president’s Human Rights Secretariat, which did not respond. However, Brazil has recently been able to point to research that shows it has been making progress in tackling illegal logging. The country’s National Institute for Space Research estimates that 6,238 sq km of rainforest was lost between 2010 and 2011, down dramatically from the 2004 peak of 27,700 sq km. The same year, Brazil pledged to cut deforestation by 80% by 2020. The year-on-year fall last year was 11% and in March Brazil’s forestry department raided and closed down 14 illegal sawmills on the borders of the Awá’s land. 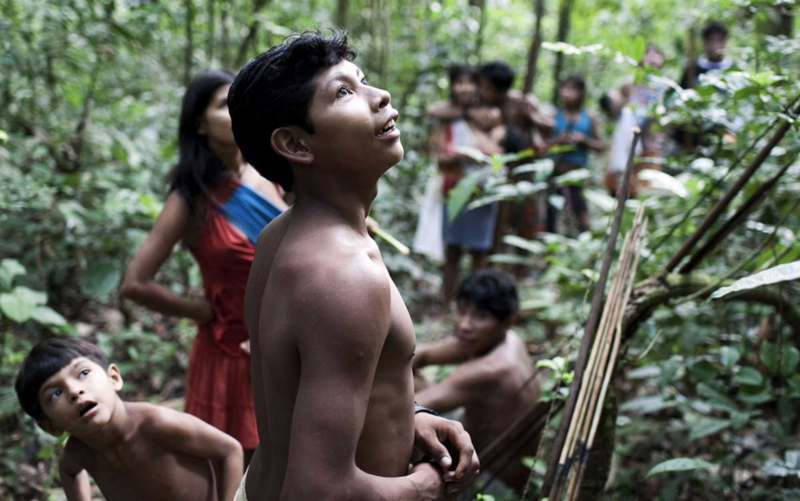 Even so, the figures also show that two states recorded sharp rises in deforestation, and illegal logging is destroying the Awá’s jungle at a faster rate than that of any other Amazon tribe.